Director of Education and Experience at The Art Effect by day. Scholar of literature, media, and popular culture by night. On the surface, the question seems simple enough. Standard opener for casual conversation. Simple questions carry complexities, though, and even though I’m expecting it, even though it’s been asked of me a million times, I somehow always struggle to answer. Even then, for many, these descriptions remain abstract. When I say I ensure and manage relationships and provide input, it can be hard to envision what that actually entails on a daily basis. It can feel like just words, lip-service lacking the weight of the real substance of the work (which is the satisfying and exhausting part). What do I do? Well, here’s a breakdown. First, I’m the primary coordinator on conducting the work involved in the aforementioned Listen for Good grant. I designed the L4G survey campaign for the overall organization, as well as co-designed with program directors mini-surveys to collect segmented feedback on program-specific issues. I oversaw implementation of the survey, getting the message out to program participants, and upon closing the survey once we got 160 responses, I analyzed the data and met with program directors to discuss turning feedback fats and trends into actionable next steps for implementing as program changes. I’m currently creating materials and an outreach plan for closing the loop with all of our audiences, and I’m excited about what we heard and how we can put this feedback to very productive use. I’m also acting Faculty Director for D-LIT, a digital literacy smartphone summer camp for middle-school students in Poughkeepsie. After co-teaching a semester-long fieldwork class on teens and iPhones in conjunction with Vassar College’s Urban Education Initiative, we’re taking our research and implementing it in this intensive summer program that will revolve around critical and creative use of smartphones. My duties include reviewing student and counselor apps, structuring intern and counselor work, creating task delegation schedules, synthesizing class research into set of best practices which we will implement in a two-week intensive this summer. I supervise the Spark Studios program. Spark Studios is probably the most innovative project I’m managing. For years, when we held after-school programs for teenagers, many of the youth we serve were in the position of needing to choose between doing our program or getting after-school jobs. We lost several students to jobs at places like McDonald’s, Target, and other service and retail industry jobs. And that’s real. If your family needs you to pull in a paycheck, suddenly after-school arts and media training programs seem like luxuries. I wanted to disrupt this cycle, to make it so that youth in Poughkeepsie didn’t have to choose between gaining the benefits our program has to offer and helping to support their families. I am happy to say that this spring, our Spark Studios program employed 12 teens as filmmakers, grips, boom operators, script writers, production managers, and more. They functioned as an entrepreneurial video production house to take on commercial work from paying clients. I am so proud of the work they’ve been doing and how well the program is working so far. One Spark Studios project has had me researching/playing with 360° filmmaking technology and overseeing our students in creating a VR film promoting the City of Poughkeepsie as a tourist destination, to be used with a publicity campaign the Walkway Over the Hudson will be running. The MADLab (Media, Arts, & Design Lab) is an arts career exploration and job skills training program that addresses the needs of Poughkeepsie youth ages 14-17 facing multiple barriers to employment. The Art Effect will be working with Scenic Hudson on the Fall Kill Community Outdoor Art Installations project, which will be the primary project of its 2018 summer youth employment session of MADLab. Through the Fall Kill Community Outdoor Art Installation project, MADLab youth will work to pull trash from the Fallkill Creek at two sites (N. Cherry St behind PUF and Pershing Ave), design original sculpture art using repurposed Fall Kill trash, and create the art/urban design installations at each site to be unveiled in an exhibition grand opening at the end of the summer. Not to mention, I handle scheduling and staffing fall classes and programs, scheduling and staffing auxiliary/offsite workshops, writing for and hosting our weekly youth-produced radio show Radio Uprising, both teaching professional development workshops (most recently, NYSATA) AND overseeing the organization’s internship program… it’s a lot. My goal is for the organization to grow such that each of the above responsibilities could become their own respective individual full-time positions, possibly even departments… if we’re looking that far down the road. For now, perhaps when asked “what do you do?” I should just start telling people I’m a juggler. Back in March, several colleagues and I attended Remix NYC, thanks to generous support from the Wave Farm Foundation. What a wonderful time we had at the Remix NYC Summit on Culture, Creativity and Technology! Two days packed full of thought-provoking speakers, stimulating conversations with colleagues old and new, and some of the coolest venue spaces NYC has to offer. Both days were attended by The Art Effect’s Director of Education and Experience (aka me) and our Spark Studios Program Coordinator Paul Thompson. Joining us on Thursday was Experience Program Assistant and Teaching Artist Sarah Taylor, and rounding out the team on Friday was our Media/Art/Design Lab coordinator David Wong. Despite our varying job titles and workloads, every single one of us found invaluable insights and solid strategies to take away for innovating and improving on our own programs. In particular, several recurring themes from across the conference struck us and stuck with us. During her presentation, Julia Kaganskiy, Director of New Inc (New Museum’s art & tech incubator) mentioned the phrase “constant beta,” and it really resonated. Being in a state of constant beta means approaching your work as being in development, existing in a constant state of testing things out and evaluating how well implementation went with an eye towards making changes for improvement next time. In an age of constant change where technology evolves on a daily basis, such flexibility and adaptability is crucial to keeping competitive. Using the same business model year in, year out will no longer hold the same promise of security. Instead, embracing “constant beta” means entering a mutually beneficial adaptive relationship with customers or clients, where supply changes in response to demand. So much is changing and being re-shaped, we have to embrace being in constant beta in order to survive and thrive. Another recurring theme was the idea of “creative disruption,” or the idea that in order to truly innovate, you need to stop your habits (or years-old strategies) and insert some totally new method, idea, or approach into things, in order to break free of the confines of routine and find views and vantage points you just couldn’t see while you were keeping your head down. The Art Effect endeavors to be as innovative as possible, but innovation means change and evolution, so if there are things we’ve been doing the same old way for years and years, if we want to be innovative, we’ve got to rethink things and disrupt ourselves to see how innovations would help us improve. We witnessed dozens of examples of truly innovative work, some of which is being done by The Lowline, an organization using NASA technology to harness the power of the sun and bring rays of sunshine underground to create parks out of abandoned subterranean spaces. Winston lives near the Barclay Center in Brooklyn, and heard dozens of concert-goers describe how inconvenient and annoying it was that Barclay required paper printouts of tickets to scan. For someone visiting from out of town, this requirement could mean doubling back and re-traveling miles and miles to find a printer. Hearing about this “pain point” over and over, it occurred to Winston that there was an opportunity there. He began bringing a portable printer and standing near the admissions line at Barclay, offering to print people’s tickets out for them… for a price. It’s this kind of responsiveness to people’s stories, this method of really listening and identifying the parts of the story involving inconvenience and annoyance, that enables people like Winston to capitalize on opportunities others may not see. For The Art Effect, the “so what?” should be straightforward–particularly after attending Remix NYC. Arts empower communities, and we help facilitate that growth and transformation. Our programs offer youth skills practice, arts exploration, and college/career opportunities they otherwise may not have gotten, and to the students we serve, it makes all the difference in the world. And while we were so glad and grateful we got to be a part of such an incredible few days, innovation is not something that is attained once and then permanently possessed, like trophy on a shelf. Innovation is a CONSTANT process, and we’ve got to keep fueling those fires on a daily basis. The past few months have seen several innovative initiatives being put into place, as well as shown several “pain point” places where we are in urgent need of creative disruption. What are those initiatives and pain points? Well, that’s a post for another day. This morning I sat down to write an update prior to Slayage 2018, the biannual international convention of the Whedon Studies Association, at which I will be delivering a keynote and which is rapidly approaching at a panic-inducing pace. I realized the last draft post I’d saved was an announcement for the Calls for Papers for two NeMLA sessions I (co)organized….. last year, in 2017. And looking further back, much to my chagrin, I realized that the last time I updated this site BEFORE that was about a year ago, when I was announcing my panels for NeMLA 2016! If you taste something funny, just might be ’cause I let this site go stale. My excuse for the delay in updates is none too juicy, either. I’ve been too busy living life–or, I should say, too exhausted from living a busy life–to be writing about it. I admire those who can lead busy, engaged lives and write daily, or even weekly, updates. But I’m not one of them. Not yet, anyway. My whole life I’ve been a side-writer, daily doing something else and occasionally writing in frantic, late-night bits of impassioned panic. While it has its own kind of magic, writing that way is physically and emotionally draining, and that’s something I want to change. Since this was originally meant to be an early 2017 update on my professional projects, I’ll preserve the language from back then. At long last, the edited anthology I’ve been working on has been published, and it’s won an award for Best Book in Whedon studies! Joss Whedon and Race: Critical Essays contains 15 essays on of race, ethnic identity, and Otherness in the works of Joss Whedon, and is available for purchase here. My co-editor (the wonderful Dr. Lowery A. Woodall III) and I are grateful for the hard work years-long efforts of all of our contributors, and for everything this process has taught us about coordinating copyright agreements, communicating requests for revision, clarifying our own vision for the book, and contributing to the vibrant scholarly community that is the Whedon Studies Association. Joss Whedon is known for exploring philosophical and political questions through socially progressive narratives in his films, television shows and comics. Whedon’s works offer critique of racial stereotypes, sometimes repudiating them, sometimes reinforcing them (sometimes both at once). Joss Whedon and Race: Critical Essays explores his representations of racial power dynamics between individuals and institutions and how the Whedonverse constructs race, ethnicity, and nationality relationships. If you follow me on social media, you’ll surely have seen by now the slew of photos/videos I posted from something called EuroSlayage. The Slayage 2016 conference, held in Kingston-on-Thames, UK, proved to be yet another momentous occasion for me, a real highlight of my life, as I saw old friends and made new ones, got to co-present with one of my academic idols (the amazing Lorna Jowett), and was given the honor of receiving a second Mr. Pointy Award for an essay published in 2015. This essay forms the basis for one of my two aforementioned NeMLA 2017 panels. I’m really excited for this book project. My work so far has included conducting close readings of Books 1-11 and scouring fansites and message boards for evidence as to how these texts were received and understood. If you’re interested, the abstract follows below. What happens when the disempowered acquire superpowers? The question resonates throughout Ms. Marvel, as Kamala Khan, nerdy, daydreaming high-school student, imagines herself within superhero stories in order to escape discrimination at school and overbearing parents at home. When she suddenly acquires her own super powers, she negotiates their acquisition as a metaphor for political empowerment. At first, the fact that a teenage Muslim-American girl engages and navigates Western models of superhero empowerment seems a subversive and politically radical enterprise. Given the Marvel canon’s overwhelming focus on superpowered characters who already inhabit privileged bodies (straight/white/cis men), Kamala initially seems a revolutionary character. However, when viewed through Post-Colonialism and Critical Visuality Studies frameworks, the politics of Ms. Marvel’s visual composition reveals a paradox of representational empowerment. As Kamala Khan engages Western constructs of visual superhero narratives, certain subversive elements are mitigated by the teleological white supremacy of these constructs; for instance, when her powers first emerge, Kamala becomes a white, blond woman, and Kamala’s first quest involves her rescuing a popular classmate who embodies white privilege (thereby reinforcing a status quo which marginalizes Kamala’s non-superpowered identity). This chapter explores the possibilities and the problematic politics of visual composition and narrative empowerment by considering how Ms. Marvel features the marriage of aesthetics and ethics through negative space and narrative subjugation to inform and deepen our understandings of racial representation in media’s affect on the real world. Building on critical visuality theorists Richard Dyer, Nicholas Mirzoeff and Scott McLoud to conduct a historically-contextualized visual explication of specific key panels (abetted by Post-Colonialists Guyatri Spivack and Chandra Mohanty), I ultimately argue that the extant issues of Ms. Marvel demonstrates a paradox wherein engagement of Western constructs of narrative empowerment reinforce the very institutionalized inequalities they elsewhere successfully destabilize. Freshly invigorated from the very inspiring 12th Northeast Media Literacy Conference, I tried today to turn my mind towards Snapchat. I attended an enjoyable and informative workshop taught by Prof. Adam Chiara on the ins and outs of using Snapchat to teach news media literacy. As Chiara advocated for its potential as teaching tool, I found myself inspired, as I’m currently advising a team of teaching artists who are implementing a program called Media Magic: Real vs. Fake News* and one of our client’s requests is to create daily short videos containing snippets of informational/digital literacy tips, insights, and illustrations (if you’re asking “why would a media education program be working for a client?”then you should read this). Chiaro was very convincing in telling us all that educators stand to benefit from embracing, learning to navigate, and even teaching with Snapchat, since it functions as a news source for so many young people. As I took in the wisdom of his words, I began to daydream about what it would look like to for the Media Magic teens to be distributing these daily videos via Snapchat. Specifically, I want to know how to use it myself. I wanted to experience it as a vehicle for creation. I wanted to dig deep into its functions and rhythms, to embrace the technology’s particular potential for creativity and storytelling–immediacy and ephemerality, the ultimate in-the-moment mode of messaging, launched by the generation who coined the phrase FOMO. If I sound a bit romantic about it, it’s because I’m covering for the sheer panic I felt when trying it out for the first time and having NO idea what to do with it. I’d heard people say “Snapchat is nothing like Facebook and Twitter” but I was still unprepared for the mental confusion I experienced when I downloaded the app, clicked the ghost in the little yellow box, and found my eyes swimming in unfamiliar shapes and colors that, surprise surprise, looked nothing like Twitter or Facebook.On both those platforms, as you likely know, you log in, you see a top-to-bottom (more or less) chronological feed from fellow users, you see a text box beckoning your own contributions –“What’s on your mind? it asks, inviting”– which proudly crowns the ever-updating pile of posts. But signing into Snapchat, I didn’t know which buttons did what. I wasn’t seeing a feed, things weren’t where I thought they’d be, I couldn’t get a grasp of which swipe movements accomplished which actions. I stumbled and clunked as I tried to navigate it. I grumbled in frustration. I had some admittedly farcical thoughts about those dang kids and their new-fangled technology. One of my teaching artists wrote down my name, and while I felt joy in realizing how much he had learned from me, I was also amused at the thought of being in any category with “grandparent” in the title (I’m only 33, for pete’s sake). I do work with a team of mostly 20-somethings, though, so if they look up to me I’m all for it. The honor in being named is the worthier part of the puzzle for sure, so I took the compliment. I thought back to my “grandparent” status when using Snapchat. My fingers were uselessly swiping at the screen, and it occurred to me that I must look to others right now the way my mom looked to me when she first got a cellphone–completely confounded, utterly helpless, pitiable, even. Grandma on Snapchat, indeed. I recalled that Chiara said Snapchat is intentionally counter-intuitive and user-UNfriendly. Its users want it to be a secret world that’s hard to access. Allow me to tell them, they are succeeding on that front. I’m still playing with it, and I’m beginning to get some of it. Mostly what I’m getting is how different the production process is when it comes to Snapchat. Typically, at Spark Media Project, when we teach the production process, we’re using a camera/lights/sound set-up, the kind of production where you set up a shot and shoot it, then remove the SD card, plug it into a computer, organize the files, drag them over into an Adobe Premiere project to edit them… the process takes awhile. Yet if I’m asking students to produce via Snapchat, what I’m asking them to do is envision a visual scene, shoot this individual scene, then post it. If they want to do a succession of scenes, they’ve got to think it through in a very linear way to shoot each one individually, then download their story for the day. It’s got to happen fast, rapid fire-motion of having the idea and then doing the idea as soon as it’s imagined. This speed, on TOP of the counter-intuitive production tools layout. Students get a lot of credit for so quickly becoming fluent in this interactive digital language. I guess once you get into the swing of it, it becomes routine. For now, though, thinking through the differences between making content for Snapchat and making a more traditional video is forcing me to bend my brain in new ways, which I always enjoy precisely because it puts me in a situation my students know all too well — the role of being a learner taking the first steps. We’ll see how it goes! Until then, check out my horrifying “taste test,” and if you’re on Snapchat, feel free to follow along with me and Spark students– @Spark_pkny and @metamare. *I initially designed this program in December, prior to the “fake news” maelstrom surrounding Trump’s incipient presidency, and I’ve since realized (due in no small part to my time at NMLC) that “real vs fake” rhetorical constructions reduce the issue to an oversimplified binary when its actually more a continuum of credibility, perspective, and bias. It’s likely that we’re going to encounter a lot of statements that contain bits of truth but are connected in a false narrative, or are based on interpretations of the truth that make sense from one perspective but can also be construed as nonsensical, and so on, and so on. Being that I’m generally a fan of destabilizing binaries, I wish I’d named it something else, but too late now. Every update on my website, it seems, is fated to begin with a similar sentiment. The thought occurs that posting nothing on my website for almost a year may give the opposite impression. Rest assured though, dear readers, I’ve been up to a great many things. So many, in fact, that when I get home from work for the day or when I have an extra hour on a weekend, I want to spend it resting and recuperating rather than writing about what it is that’s been exhausting me. And while I’m exhausted, I’m also enthused and inspired! Let me tell you all about my many projects at present. I’m teaching two sections of Film Vs Video On YouTube for middle-school students. You can read more about that here. Also on my docket at Spark Media Project: managing our internship program (we have 10 interns this semester…so far! ), overseeing the implementation of our FRAME programs as well as our DROP Studios programs, handling media education contracts with the Adriance Library and Family Service’s Office of Sexual Violence Prevention… I’m getting to collaborate with many wonderful people on producing media products that critically engage with our society and speak truth to power. I’ll be posting more about specifics soon. For now, though, you should check out this amazing documentary created by last year’s DROP TV youth producers. We just learned it’s been accepted to the Tower of Youth Film Festival, and we couldn’t be prouder! Watch it here! Potential panelists must sign into the NeMLA system to submit their abstracts to one or both panels. To log in, to create an account, and to get more info on what that entails, go here. The deadline is September 30th, and I’m very open to discussing abstracts and their suitability to the topic prior to submission, so drop me a line if you’re interested! I’m working on a chapter for the forthcoming anthology Can the Subaltern Be A Superhero? The Politics of Non-Hegemonic Superheroism. My chapter explores the interdependence of aesthetics and politics in the recent Ms. Marvel comic series featuring Kamala Khan, and is tentatively entitled: “Negative Space and Narrative Subjugation: The Paradox of Representing Empowerment in Ms. Marvel.” It’s been a fascinating research project so far, and now comes the time for turning notes into prose. Or, as I like to call it… the hard part. There’s a lot on the docket, a lot of strands in the ol’ duder’s head (to quote The Big Lebowski), but I’m grateful to be involved in so many interesting projects that mean so much to me. Calling all scholars of Film/TV/Literature/Comics! The deadline for all abstracts to be submitted for the March 2016 meeting of the Northeast Modern Language Association is coming up this Wednesday 9/30. In worlds full of superhuman heroes, mythological imaginary creatures and battle narratives of epic scope, what is the role of the domestic? This panel session seeks proposals investigating the ways in which domestic spaces function within superhero narratives as sites of union and/or conflict between the human, the subhuman, and the superhuman. How do teenage vigilantes like those in Runaways construct unconventional homes? How do familial/community obligations inspire the Hell’s Kitchen resident Daredevil to defend his hometown? How have heterogeneous, even internally combative, groups like the X-Men and the Justice League been imagined as odd couple household scenarios? How have extraterrestrials such as Superman used domestic ideology to make sense of their self-appointed mission to protect their adopted homes, and how may domestic ideology help us make sense of reading these characters’ stories as allegories of immigrants’ experiences? This session seeks proposals that explore how domestic ideology informs and functions within superhero stories, as well as how humanity and the human are depicted in the context of domestic spaces within superhero narratives. The “Black Widow babygate” plot thread in Avengers: Age of Ultron, for instance, is ripe for exploration through the lens of the literary domestic. Submissions for both CFPs are due this Wednesday, September 30. Abstracts must be submitted online at https://www.cfplist.com/nemla/Home/S/15845, with a free CFP List NeMLA account. If you have any questions, please email maryiatrop@gmail.com and derek.s.mcgrath@gmail.com. How and why does Shakespeare matter in the 21st century? Belonging to both ‘high brow’ and ‘low brow’ culture, his plays have always functioned as an important site of cultural [re]production. Merely mentioning his name today signifies esoteric intellectualism and artistic excellence, despite a history of pop-cultural and commercial success that perennially ensures even illiterate audiences can enjoy Shapespearean products and performances. His popularity persists across centuries and media formats, as Shakespeare lives on today through frequent cinematic adaptations, contemporary theatrical stagings, even in digital comic-book form. In what ways do twenty-first-century adaptations of the Bard’s works refashion, reinvent, and/or comment upon the original texts (’original,’ of course, being itself a vexed term in light of Shakespeare’s reputation for plagiarism)? In what ways are Shakespeare’s plays transformed through visual culture’s adaptation from one medium to another? What new insights are revealed about Shakespearean works through the art of adaptation in the digital age? This panel seeks proposals that examine, interrogate, and assess interpretations, adaptations, and/or [re]visions of Shakespeare’s works in the 21st century. Proposals may wish to address the question of what constitutes ‘reading’ in visual/popular/digital cultural contexts, especially in light of increasing collaboration between new and emerging media and more traditional logocentric modes of literary production. Essays focusing on adaptations/reinterpretations by specific writers/directors are welcome, as are comparative essays investigating thematic connections throughout a selection of adaptations. Please Note: This year, NeMLA has implemented a user-based system to accept and track abstract submissions. In order to submit an abstract using the button for a CFP entry, you must **sign up* <https://nemla.org/users/?operation=register>*with NeMLA and **log in* <https://nemla.org/users/>*. Using this new system, you can manage your personal information and review and update your abstract following submission. Signing up is free, and you only have to do it once. * Interested participants may submit abstracts to more than one NeMLA session; however, panelists can only present one paper (panel or seminar). Convention participants may present a paper at a panel and also present at a creative session or participate in a roundtable. Hello, Internet! It’s been awhile since my last update. I’ve been busy finishing up my MPS degree, managing four separate 21st Century Learning Community programs, advising team of nine teachers, teaching my own middle-school filmmaking classes, overseeing CMP’s Media Magic, Radio Uprising and Media Monsters programs . . .the list goes on and on. But as I always say, it’s better to be busy than the other thing! 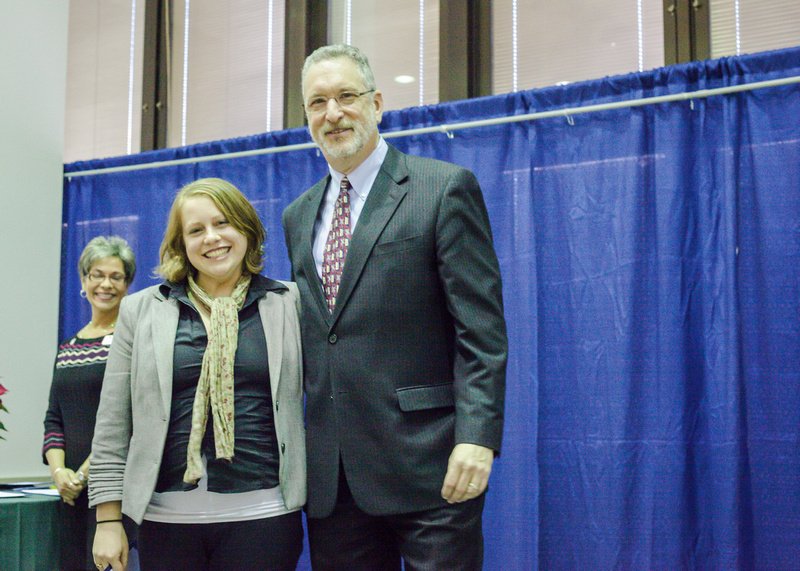 Here I am at the award ceremony, with Dean Michael Rosenberg of SUNY New Paltz’s School of Education. I’ve got several conference presentations coming up. Hope to see you there! NOW ACCEPTING ABSTRACTS — CFP HERE!